Background: Loss of control in flight (LOC-I) was the leading cause of fatalities in commercial aviation between 2001 and 2011. Consequently, reducing the number of LOC-I accidents is now a priority of the International Civil Aviation Organization (ICAO). ICAO and other stakeholders have developed harmonized training requirements to address LOC-I events, and ICAO recently published the Manual on Aeroplane Upset Prevention and Recovery Training in 2014. With emphasis on tightly integrating academics with flight simulation training device (FSTD) and on-aeroplane tracks, the manual provides guidance to developers and providers of upset prevention and recovery training (UPRT) programs. Experiences acquired during the early stages of a pilot’s development shape that pilot’s approach to operating aeroplanes. Those experiences, however, can produce positive or negative results. To maximize the UPRT learning experience, this paper provides additional guidance on three core issues related to the on-aeroplane training track: On-Aeroplane Training Considerations, Aeroplane and Equipment Considerations, and Instructor Considerations. Although this paper was prepared in response to the ICAO initiative for commercial aviation, the considerations offered apply equally to UPRT programs for general aviation, where LOC-I was identified as the top fatal accident category in that sector as well. Maximizing the effects of adrenalized learning by integrating academics, practical training, and instructor competencies with a structured experience throughout the flight envelope and stall/spin upset red zones. Hands-on experience beyond 45 degrees of bank, and more importantly, to 180 degrees of bank. At some point, on-aeroplane UPRT must therefore make use of aeroplanes capable of operation in the acrobatic category. Hands-on experience at high angles of attack, including full aerodynamic stalls and spin departures. At some point, on-aeroplane UPRT must therefore make use of aeroplanes approved for intentional spins. Instructors who have been qualified to deliver UPRT by well-developed and enforceable standards. The next steps in the evolution of UPRT program standards should include expanding the considerations presented in this paper into the detailed requirements necessary for the safe and effective delivery of on-aeroplane upset training, using mission-appropriate aeroplanes and equipment, under the tutelage of professional and qualified instructors. Frightened human beings will only do what they’re trained to do…. You don’t rise to the occasion. You sink to the level of your training. Loss of control in flight (LOC-I) was found to be the leading cause of fatalities in commercial aviation between 2001 and 2011. An aeroplane upset, defined in part as “an in-flight condition by which an aeroplane unintentionally exceeds the parameters normally experienced in normal line operations or training,” often preceded fatal LOC-I events. Responding to the findings, numerous aviation organizations undertook initiatives to investigate LOC-I phenomena, examine current training practices, and develop mitigating strategies. UPRT resources are divided into two training tracks: academic and practical. Practical training is further subdivided into two parts: on-aeroplane and flight simulation training device (FSTD). It is also well understood that experiences acquired during the early stages of a pilot’s development shape that pilot’s approach to operating aeroplanes, and equally important, that the lessons learned are perishable. The application of upset prevention and recovery skill sets, therefore, not only needs to be reinforced continually throughout a pilot’s career, but also needs to be framed continually within the proper context. ICAO’s recognition of the importance of tightly integrating academics with practical experience is consistent with models designed to help participants achieve peak performance. In this case, helping pilots achieve peak performance during an impending or full aeroplane upset. The literature, particularly as it relates to sports, is replete with information on the effects adrenaline has on new learning. Unfortunately, the effects can produce positive or negative results; therefore, it is imperative for training providers to guard against the introduction of negative training at all stages in the process. The framework of academics, on-aeroplane, and FSTDs, coupled with consistency of language, concepts, techniques, and application across all stages, will provide pilots with the strongest and most enduring learning experience possible. Cementing the training to maximize the stated goals of UPRT, however, will require pilots to have an adrenalized, on-aeroplane experience. It is the on-aeroplane experience where academics become reality; where techniques practiced in FSTDs can be applied under real-time constraints and with more accurate aerodynamic behavior; and where pilot stress levels can be manipulated to levels comparable to those of real-life upsets, but in a controlled environment where skill sets can be perfected, bonds to mental models for recovery strengthened, and confidence gained. While Flight Simulation Training Devices (FSTDs) are an essential part of UPRT, ICAO notes, “current FSTDs have limitations that render them incapable of providing the complete exposure to conditions synonymous with preventing or recovering from [an] LOC-I event…. These areas of missing experience provide gaps in pilots’ understanding and proficiency when confronted with an actual upset.” Consequently, on-aeroplane UPRT is seen as necessary to fill the gaps. ICAO further acknowledges that on-aeroplane training provides experience and confidence in the psychophysiological domain of upsets that cannot be fully realized in FSTDs alone. The value of properly delivered on-aeroplane UPRT is undisputed. Further, the UPRT framework relies on three interlocking levels of mitigation and intervention: awareness, prevention, and recovery. This section addresses the degree of on-aeroplane exploration of the flight envelope necessary for an optimal UPRT experience, particularly as it relates to recovery. UPRT pushes trainees beyond their normal comfort zones to increase their awareness of upset causes, ability to initiate preventive actions to mitigate a developing upset, and capacity to apply appropriate recovery techniques should they be required. Most trainees will associate the prospect of on-aeroplane UPRT with higher levels of risk, and therefore, stress. Tight coordination between academics, practical training, and instructor competencies is essential to manage trainee stress to a level that permits positive learning to take place despite the potentially debilitating human factors identified in the ICAO Manual. These include startle factor, disorientation, overreaction, fixation, and cognitive bias. Consistently achieving peak performance will be made possible in the UPRT environment by developing new understandings through academics and practical training. It is equally important for trainees to understand the connection between body, mind, and emotion; practice awareness, prevention, and recovery skill sets; and recognize the importance of trust and teamwork in both the training and operational environments. The ability to internalize and continuously integrate these elements is optimized when learning takes place in the intense, adrenaline-rich environment of the cockpit. Such an experience can also jump start a continuous process that allows trainees to achieve peak performance not only in the short term (i.e., during UPRT itself), but also thereafter by applying the knowledge and experience gained to the operational context. Trainees have a positive training experience. Not all learning is beneficial; it can be a positive or negative experience. Adrenalized learning in particular has the most profound and lasting effects on one’s perceptions, psyche, and ability to perform in similar situations. For example, pilots will always remember their first spin. Adrenaline permanently etches the experience in memory, and it can be recalled in vivid detail long after the event. If that first experience occurs inadvertently, or in an unstructured environment, fear will be exacerbated and confidence eroded. The result will be a strong desire to avoid similar situations in the future. So much so that the pilot might give unnecessarily or unacceptably wide berth to the perceived threat, or may become overly stressed even in normal situations. On the other hand, if that experience is provided in a methodical, controlled environment, the trainee will come away from it with a strong sense of accomplishment and confidence. Equally important, the likelihood that the trainee will be able to perform the exacting physical movements required for recovery, even though understandably stressed, will be greatly improved. Consistent with the Airplane Upset Recovery Training Aid – Revision 2, the ICAO Manual defines an upset as “an in-flight condition by which an aeroplane unintentionally exceeds the parameters normally experienced in normal line operations or training. An upset is generally recognized as a condition of flight during which the pitch of the aeroplane unintentionally exceeds either 25 degrees nose up or 10 degrees nose down; or a bank angle exceeding 45 degrees; or flight within the aforementioned parameters but at inappropriate airspeeds.” This definition identifies flight envelope and airspeed excursions as core training regions for the mitigation of LOC-I threats. Using the pitch and bank parameters that define an upset, Figure 1 depicts in green the normal (i.e., non-upset) envelope. Superimposed in yellow is the envelope commonly explored during training for commercial licensing. Highlighted in red, the remaining flight envelope represents not only the domain of real-life upsets, but also the region where on-aeroplane UPRT can yield the greatest dividends. 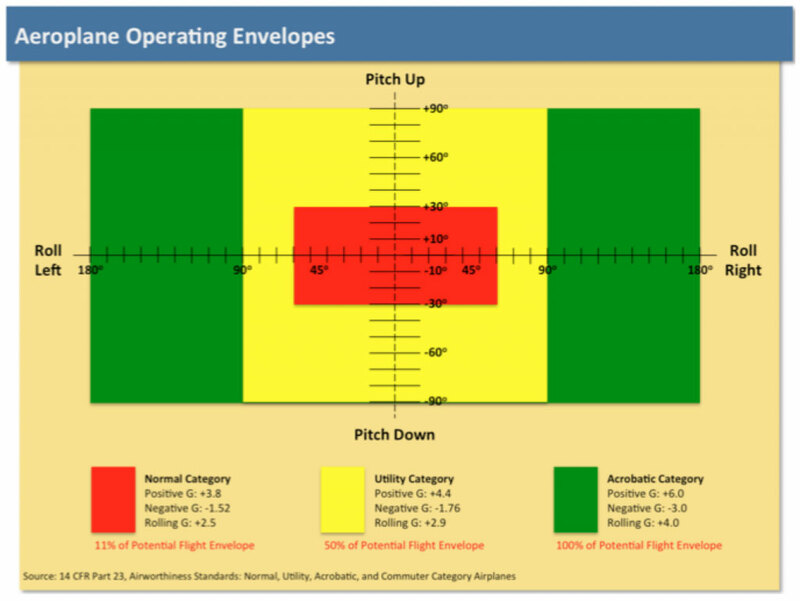 Although most commercial pilots will necessarily spend the majority of their time in the green zone, it represents just five percent of the potential flight envelope. 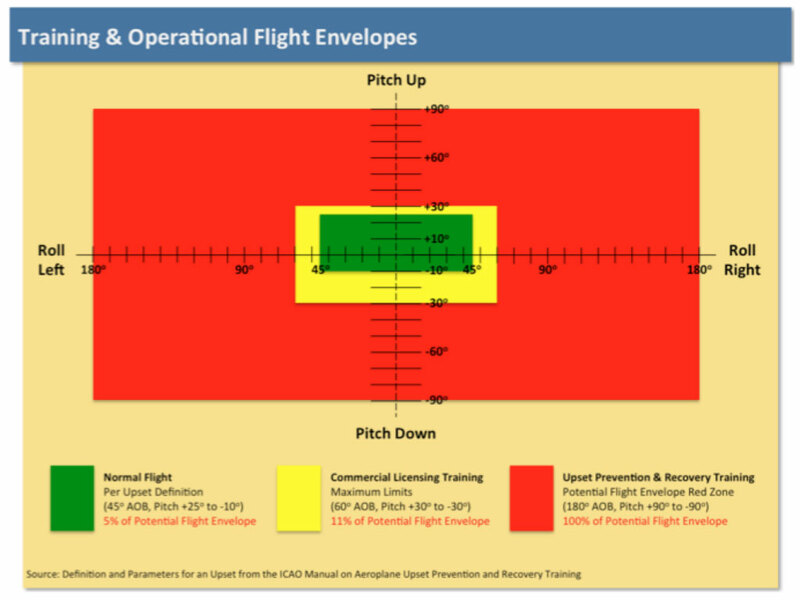 And their experience in the yellow zone typically will have been limited only to the hours needed to qualify for commercial licensing and represents a stretching of the pilot’s envelope to just eleven percent of the potential flight envelope. As upsets leading to fatal LOC-I events have revealed, the awareness, skills, and discipline reinforced by many hours of operation in the green zone do not adequately prepare pilots for excursions into the much broader red zone. 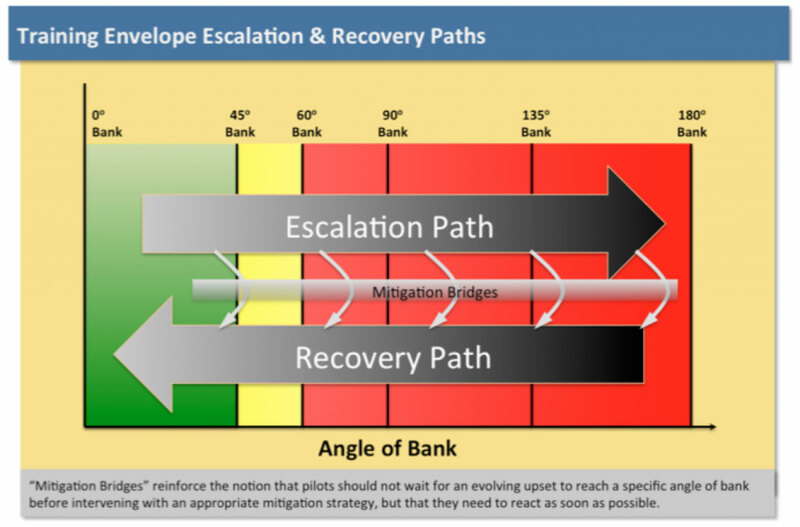 Instilling the notion that intervention must be taken regardless of the upset bank angle, rather than at some artificially set point on the escalation path (Figure 2). The true exponential relationship between bank angle and the G-load required for steady flight is revealed only as bank angle exceeds 60 degrees. The truly adverse effects of instinctive reactions by the pilot, on the other hand, are revealed only as bank angle exceeds 90 degrees. Hence, red zone bank angles up to 180 degrees must be experienced not only to mitigate the potential cascading of unfavorable aerodynamic and psychophysiological factors, but also to maximize the effects of adrenalized learning. Proper and improper recovery actions could be demonstrated to reinforce the mental discipline and physical precision needed to work through proper recovery techniques under the duress of an upset, regardless of the bank angle encountered. Academic knowledge regarding what recovery technique to apply in a given situation, and how to apply it, is an important and necessary part of UPRT. The ability both to recall techniques and to perform effective control movements while under duress, however, is an altogether different-yet-critical issue. As the ICAO Manual recognizes, only on-aeroplane experience is capable of accurately replicating the psychophysiological difficulties associated with recovering from an upset. Whether simulated on-aeroplane or real during routine operations, the aerodynamic, aeroplane performance, and human factors of an upset can conspire—in real time and against real constraints—to reduce the probability of a successful outcome. On-aeroplane training is vital to the integration of the pilot’s mental and physical capabilities even though in an adrenalized state. This integration, however, will be incomplete if the UPRT experience fails to escalate fully into the UPRT red zone. Many of these and other correctable pilot errors do not manifest until beyond 90 degrees of bank and will exacerbate as bank angle approaches 180 degrees. Consequently, progressively escalating into the red zone will allow the pilot to practice the “push-then-roll” technique at lower bank angles and reduced stress levels. Training can then proceed beyond 90 degrees where potentially debilitating effects such as startle can be worked through while simultaneously executing “push-then-roll” actions. Thus on-aeroplane exploration of bank angles from 90 up to 180 degrees (the worst-case scenario) will be critical to the success of recovering from real world upsets. References to exceeding the parameters “normally experienced in normal line operations or training” and “inappropriate airspeeds” contained in the definition of an upset point primarily to the mismanagement of angle of attack (AOA). Figure 3 shows a generic plot of Coefficient of Lift versus AOA. The green part of the curve represents the range of normal operating AOAs and, by inference, appropriate airspeeds. The yellow section represents the region of AOAs usually associated with slow flight, including stall warning. The red section represents the aerodynamically stalled condition; this is the domain of real-life upsets and is where on-aeroplane UPRT can yield the greatest dividends. Nearly 50 percent of fatal LOC-I accidents occur as a result of an aerodynamic stall. This clearly demonstrates that the awareness, skills, and discipline reinforced while on the green portion of the Lift curve do not adequately prepare pilots for higher AOA excursions. It is also important to acknowledge that high AOA excursions can lead to inappropriate pitch and bank excursions as well, and vice versa. 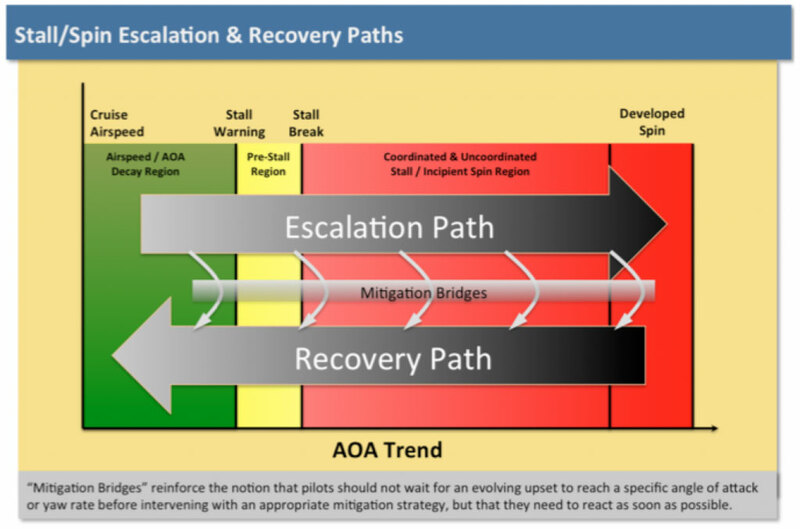 Hence, on-aeroplane UPRT must include escalation into, and recovery from, both flight envelope and AOA red zones. 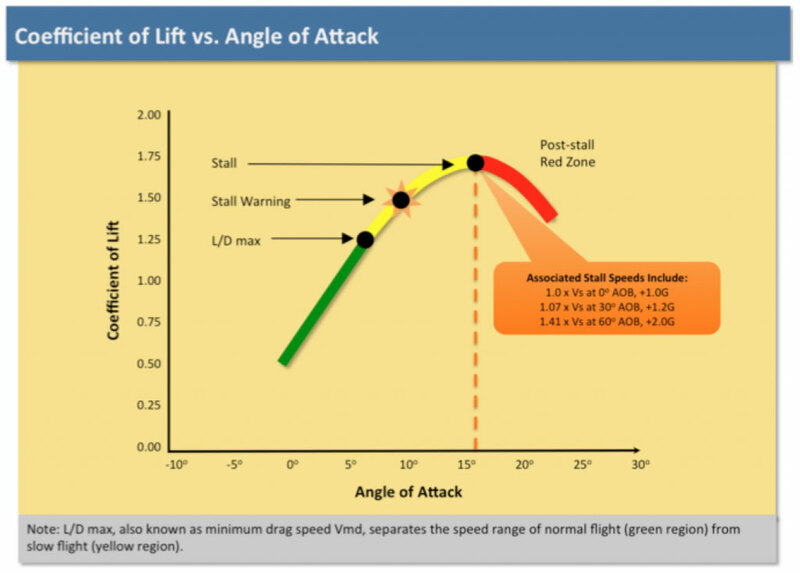 On-aeroplane UPRT will provide a much-needed opportunity to address many of the gaps in understanding and proficiency concerning stalls and spins. Coupled with the guidance provided in Advisory Circular 120-109, the stall training now mandated in the U.S. at the Part 121 air carrier level is a step in the right direction and has set the standard for stall training in FSTDs for the foreseeable future. The ICAO Manual also provides for stall awareness, prevention, and recovery training as a central part of the UPRT initiative. Instilling the notion that intervention should be taken regardless of the upset AOA, rather than at some artificially set point on the escalation path (Figure 4). Undesirable changes in flight characteristics and their ramifications on controlled flight only reveal themselves during high AOA flight. The aggravating effects of instinctive reactions by the pilot are revealed only as control effectiveness decays at high AOA and the airplane begins to exhibit post-stall behavior. Red zone AOAs must therefore be experienced not only to mitigate the potential merging of unfavorable aerodynamic and psychophysiological factors, but also to maximize the beneficial effects of adrenalized learning. Proper and improper recovery actions could also be demonstrated to reinforce the mental discipline and physical precision needed to work through proper stall and spin recovery techniques (i.e., mitigation bridges). The effects of high AOA flight while in coordinated and uncoordinated flight should be explored as well. Again, progressive escalation into the stall/spin red zone will allow the pilot initially to practice stall/spin recovery techniques at reduced stress levels before experiencing and working through the potentially debilitating human factors associated with more aggravated scenarios. On-aeroplane exploration of cross-controlled stalls and incipient and developed spins will be critical to the success of recovering from a real world upset. Practical training resources include the use of aeroplanes and FSTDs. It is the on-aeroplane experience, however, where theory truly becomes reality; where pilot stress levels can be manipulated to levels comparable to those of real-life upsets, but in a controlled learning environment where techniques can be perfected and the bonds to mental models for recovery can be cemented. It is the on-aeroplane component where pilots gain necessary confidence in the training methodology and where the recurrent training mindset is fostered. The on-aeroplane component includes, among other things, intentional training operations near and above critical AOA and to extreme bank angles not encountered during routine flight. Regardless of the aeroplane being used, the safe and legal delivery of UPRT requires due consideration of the training aeroplane’s approved operating limitations, design limits, and available margins of safety. The success of UPRT will also depend on buy-in from both aircraft manufacturers and insurance underwriters—without their support, efforts to deliver practical UPRT will be stymied. With this in mind, let’s look at the practicalities of providing UPRT in the normal, utility, and acrobatic categories. (3) Lazy Eights, chandelles, and steep turns, in which the angle of bank is not more than 60 degrees. Thus in the normal category, operating limitations prohibit intentional maneuvers that exceed 60 degrees of bank. Intentional spins are prohibited as well. Consequently, an accidental spin in the normal category would have a slim, one-turn margin of safety wherein recovery can be assured, provided proper spin recovery actions are implemented immediately and sufficient altitude remains in which to recover. (2) Lazy eights, chandelles, and steep turns, or similar maneuvers, in which the angle of bank is more than 60 degrees but not more than 90 degrees. Thus in the utility category, operating limitations prohibit intentional maneuvers that exceed 90 degrees of bank. Intentional maneuvers with bank angles in excess of 60 degrees, however, will require approved parachutes to be worn by the trainee and the instructor. 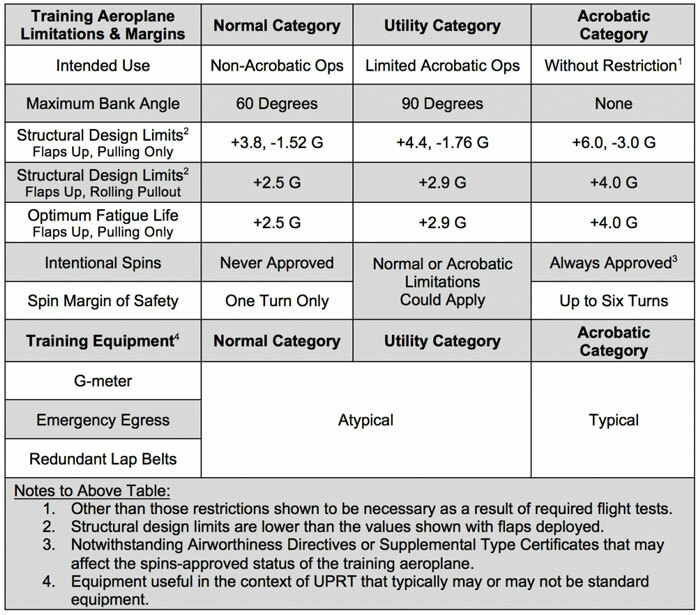 Whether or not intentional spins are approved in the utility category depends on the particular aircraft. For example, the Cessna 152 is approved for intentional spins within its utility envelope (notwithstanding Airworthiness Directives or Supplemental Type Certificates that may affect the spins-approved status), whereas intentional spins are not approved in the Beechcraft A36 within its utility envelope. When intentional spins are prohibited, an accidental spin would have a slim, one-turn margin of safety wherein recovery can be assured, provided proper spin recovery actions are implemented immediately and sufficient altitude remains in which to recover. (c) The acrobatic category is…intended for use without restrictions, other than those shown to be necessary as a result of required flight tests. Thus in the acrobatic category, the only maneuver restrictions are those imposed following flight testing. Intentional maneuvers with bank angles in excess of 60 degrees, however, will still require approved parachutes to be worn by the trainee and the instructor. Intentional spins are approved in the acrobatic category (notwithstanding Airworthiness Directives or Supplemental Type Certificates that may affect the spins-approved status). An accidental spin in the acrobatic category could have up to a six-turn margin of safety wherein recovery can be assured, provided proper spin recovery actions are implemented and sufficient altitude remains in which to recover. Aeroplane structural design limits vary not only between the various categories, but also in the same aeroplane depending on its configuration (flaps up or down) and on how G-load is applied (symmetrically or asymmetrically). Unless specified otherwise, the default design limit with the flaps deployed is considerably lower than it is with the flaps retracted: +2.0 G with flaps down and symmetrical G-loading (i.e., pulling only). Additionally, asymmetrical design limits (i.e., pulling and rolling simultaneously) are required to be two-thirds of the symmetrical limits. In the normal category, design limits with flaps up and symmetrical G-load are +3.8 and -1.52 G. The design limit when simultaneously rolling and pulling, however, drops to +2.5 G. Thus the structural margin of safety in the normal category during an inadvertent rolling pullout would only be +2.5 G provided the flaps were retracted. In the utility category, design limits with flaps up and symmetrical G-load are +4.4 and -1.76 G. The design limit when simultaneously rolling and pulling, however, is +2.9 G. Thus the structural margin of safety in the utility category during an inadvertent rolling pullout would be +2.9 G provided the flaps were retracted. In the acrobatic category, design limits with flaps up and symmetrical G-load are +6.0 and -3.0 G. The design limit when simultaneously rolling and pulling, however, drops to +4.0 G. Thus the structural margin of safety in the acrobatic category during an inadvertent rolling pullout would be +4.0 G provided the flaps were retracted. Design limits denote points beyond which structural deformation or catastrophic failure is possible. Often overlooked yet equally important is the cumulative effect of repeated G-loads on aeroplane components. There is an exponential relationship between G-load and the fatigue life of wing structures, engine mounts, seat frames, windows, and other major components, namely: relatively small increases in G-load can result in dramatically reduced life cycles. While perhaps not the deformation or catastrophic failure concern associated with design limits, structural fatigue definitely impacts the cost of, and comfort with, the delivery of UPRT. Higher G-loads can lead to increased aircraft maintenance and downtime—translating into increased delivery costs—as well as increased risk to pilots flying the subject aeroplanes. Note: Although pilots may casually refer to an aeroplane’s capability as being acrobatic or utility, aeroplanes can be certificated in multiple categories. The Standard Decathlon, for example, looks and is considered to be acrobatic, yet it is actually a dual category aeroplane: it has both normal and acrobatic operating envelopes. Consequently, the aeroplane’s intended use, approved maneuvers, and design limits will depend on how it has been loaded. Research into aeroplane fatigue life along with practical experience have shown that conducting UPRT-type flight operations at approximately two-thirds of the design structural limit will result in routine wear and tear, whereas repeated operations closer to design limits will accelerate wear and tear., Considering fatigue life for the “flaps up, pulling only” case, the practical (i.e., operational) G-load should be limited as follows: +2.5 G normal category, +2.9 G utility category, +4.0 G acrobatic category. This also provides a suitable safety margin to the design limits in the event of an unplanned or trainee-induced situation. Consideration must also be given to on-aeroplane equipment that may be important to, or legally required for, UPRT operations. With the exception of spin training, 14 CFR Part 91, Section 91.307 stipulates that no pilot of a civil aeroplane carrying any person (other than a required crewmember) may execute an intentional maneuver that exceeds 60 degrees of bank or 30 degrees of pitch relative to the horizon, unless each occupant is wearing an approved parachute that has been repacked at specified intervals. Aeroplanes approved for use in the acrobatic category are typically equipped with G-meters. This instrument not only allows the monitoring of the stresses imposed on training aeroplanes, but it also provides important context during UPRT to calibrate trainees to acceptable load factors vis-à-vis design structural limitations. Aeroplanes restricted to normal and utility category operations typically are not equipped with G-meters. Aeroplanes approved for use in the acrobatic category are typically equipped with doors, canopies, and windows that are capable of being jettisoned for in-flight emergency egress. Aeroplanes restricted to normal and utility category operations, by comparison, typically are not equipped to facilitate in-flight emergency egress. Aeroplanes approved for use in the acrobatic category are typically equipped with dual lap belt systems. This redundancy provides a greater margin of safety should a lap belt attach point fail, or a pilot inadvertently unlatch a lap belt during UPRT. Aeroplanes restricted to normal and utility category operations typically are not equipped with redundant lap belts. In order for pilots to achieve peak performance during an impending or full upset, they must have hands-on UPRT experience in an aeroplane. And while elements of on-aeroplane UPRT are feasible in all three categories, such training will not be complete unless and until the pilot can experience on-aeroplane training in the acrobatic category. Training in the acrobatic category offers the widest range of possible maneuvers, the greatest aerodynamic and structural margins of safety, and access to important ancillary equipment. The following table summarizes the considerations presented in this section. A qualified instructor is arguably the single greatest asset to UPRT, not just for the delivery of the requisite academic and practical training, but also for the mitigation of risks associated with the training itself. Conversely, an unqualified instructor will quickly become the greatest liability to the success of the UPRT initiative. The qualifications of on-aeroplane instructors in particular require special consideration if the benefits envisioned from UPRT are to be realized. Previously, general knowledge of UPRT concepts and principles has not been required of pilots, including instructors. As the UPRT initiative expands and evolves from an unregulated to a regulated state, however, new concepts will be injected into the aviation lexicon and new knowledge and skills will become a core competency for all professional pilots. The specific competencies demanded of UPRT instructors do not exist in current instructor training and certification requirements. Even current stall and spin awareness training mandates for flight instructor applicants have proven inadequate, resulting in demonstrable—and almost universal—deficiencies in both instructor understanding of high AOA dynamics and instructor competency relative to providing adequate stall and spin instruction. The on-aeroplane UPRT environment necessitates high levels of instructor competency in, and comfort with, flight regimes well beyond normal operations, the performance and operating limitations of different training aircraft, and the ability to respond appropriately to inadvertent upsets encountered in the training environment. A failure to adequately qualify UPRT instructors from the outset could have dire consequences on safety and thus on broad acceptance of the UPRT philosophy. Among the many responsibilities accepted by an on-aeroplane instructor, ensuring the safety of flight is the most critical—even above delivering the planned training. 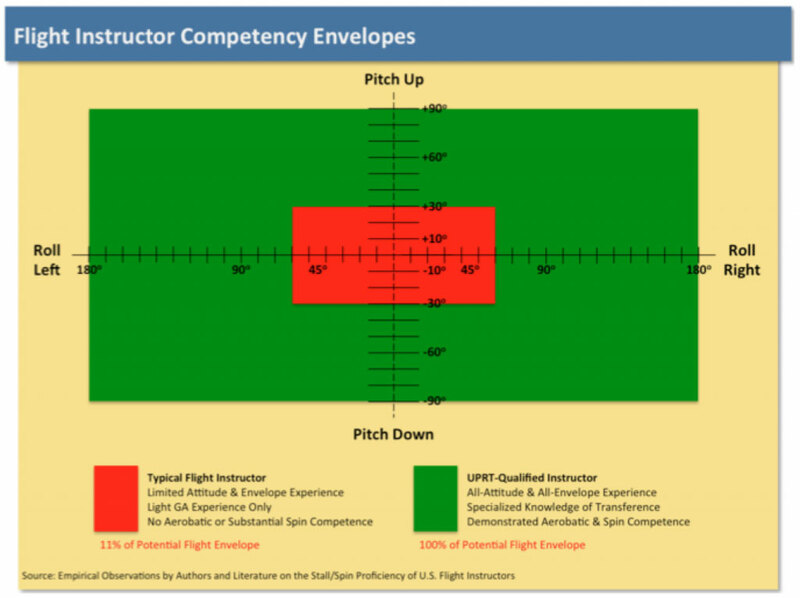 The nature of on-aeroplane UPRT demands that these instructors must not only be capable of delivering the training, but must also be expert practitioners of UPRT techniques themselves. In contrast to upsets encountered during normal operations, on-aeroplane UPRT presents scripted upset scenarios (imminent and full) to the trainee. This is necessary to highlight the escalation of attitudes, aircraft and control characteristics, and other warning signs that precede an upset, as well as the process for recovery should the aircraft depart controlled flight. Guided by a qualified instructor, the trainee is introduced to available warning cues and behaviors, while simultaneously gaining confidence in recovery methodology and techniques. Should an unplanned upset occur, the areas of intervention for the UPRT instructor are the same as for any aircraft upset: awareness, prevention, recovery. The main difference during UPRT is that unplanned upsets will likely be driven by improper reactions on the part of the trainee. As noted previously, margins of safety will depend on the type of upset encountered vis-à-vis the aeroplane category in which the training is being conducted. The UPRT instructor must maintain situational awareness and the composure to intercede before safety margins evaporate. Awareness for the UPRT instructor involves continual cognizance of the aeroplane’s attitude and energy state; the rate of potential and kinetic energy gains and losses; and the margins to aeroplane, airspace, and procedural operating limitations. Prevention for the UPRT instructor involves establishing and adhering to predetermined abort points to avoid situations that could infringe on flight safety. Recovery for the UPRT instructor involves the initiation of the prescribed transfer of controls followed by the correct application of the appropriate recovery techniques. It is equally educational for trainees to observe their instructors exercising such awareness and prevention (and if necessary, recovery) to avoid training hazards—the real-life application of UPRT principles and compliance with standards demonstrated by the instructor can convey a powerful message. Applying the knowledge gained during academic and FSTD training to the on-aeroplane experience allows trainees to practice UPRT techniques in a controlled environment that will closely resemble that of an actual upset. There may be instances when trainee attempts at recovery are incorrect or not prompt enough to maintain a suitable margin of safety. In such instances, the instructor will have to intervene, possibly while having to deal with time or other dynamically changing constraints. In addition to having a command of UPRT material and skills, this is added reason to insist that UPRT instructors possess a high level of experience in the all-attitude/all-envelope domain. The ICAO Manual correctly points out, however, that UPRT is distinctly different from acrobatic training; it would be a mistake, therefore, to assume that acrobatic instructors would automatically qualify as UPRT instructors. The only way to ascertain a level of “experience” appropriate to UPRT is through an in-flight demonstration of proficiency in situations approximating those that might be encountered in the training environment. UPRT instructional proficiency for the trainer is just as perishable a skill as upset training is for the trainee; thus, standards for UPRT instructors can only be maintained through periodic demonstrations of proficiency. The issues touched on in this section underscore the capabilities that should be demanded of UPRT instructors. This includes standardizing the transmittal of accurate information along with practical skills. The instructor will be the lynchpin to the success of UPRT programs; this important and noble initiative will fail if viewed otherwise. Exposure to one inept instructor can be far more detrimental to a pilot’s development than exposure to a dozen quality ones. In the context of UPRT for pilots at the commercial and air transport levels, inept instruction can have very far reaching implications. Good instructors will be indispensable; establishing and maintaining high standards for them, imperative. Formalizing the initial qualification and re-evaluation mechanisms for UPRT instructors is a logical next step. So, too, is developing mechanisms to ensure standardization of terminology, principles, and applied techniques across the academic and practical training tracks. The Airplane Upset Recovery Training Aid is accepted as a leading reference for UPRT information and should be consulted as UPRT instructor requirements are further developed. ICAO and its partners are to be commended for taking a proactive approach to address the serious issue of loss of control. The Manual on Aeroplane Upset Prevention and Recovery Training is an historic document, representing a significant step toward the reduction of fatal LOC-I accidents. To advance the framework developed therein, this paper has laid out the primary considerations for the safe and effective delivery of the on-aeroplane training component. The powerful effects of adrenalized learning during on-aeroplane UPRT will be maximized by closely integrating academics, practical training, instructor competencies, and structured on-aeroplane experience throughout the flight envelope and stall/spin red zones. On-aeroplane UPRT must involve hands-on experience beyond 45 degrees of bank, and more importantly, to 180 degrees of bank. At some point, on-aeroplane UPRT must make use of aeroplanes capable of operation in the acrobatic category. On-aeroplane UPRT must involve hands-on experience at high AOA, including full aerodynamic stalls and spin departures. At some point, on-aeroplane UPRT must make use of aeroplanes approved for intentional spins. A qualified instructor is arguably the single greatest asset to the success of ICAO’s UPRT initiative. Hence, extreme care should be exercised in the development and enforcement of UPRT instructor standards. Randy Brooks is a Master Instructor, member of the Society of Aviation and Flight Educators (SAFE), UPRT instructor, and VP of Training with a background in many facets of business aviation. His airshow acrobatic experience includes formation team demonstrations, jet aircraft, and sailplanes. He has delivered more than 3000 hours of flight instruction and is President of UPRTA. Paul ‘BJ’ Ransbury is the President of Aviation Performance Solutions, a multi-national flight school that trains more than 1000 professional jet pilots annually in integrated UPRT. He is a four-time Master Instructor, SAFE member, former airline pilot, military fighter pilot and fighter weapons instructor course graduate with more than 4500 hours of flight instruction in piston and jet aeroplanes. Rich Stowell is an eight-time Master Instructor, SAFE member, the 2014 National FAA Safety Team Rep of the Year, and the 2006 National Flight Instructor of the Year. He has been a full-time instructor specializing in spin and emergency maneuver training since 1987, has provided more than 8600 hours of flight instruction in light aeroplanes, and is the author of three aviation textbooks. Copyright Aviation Performance Solutions, LLC and Richard Loren Stowell, 2013, 2014. To be consistent with language used by ICAO, the authors have used “aeroplane” in lieu of “airplane” throughout this paper. Sgt. Jim Heuston, “’Vaccine’ touted for combat stress,” quoting Lt. Col. Dave Grossman, Marine Corps News, September 20, 2004. Adapted from Bruce K. Siddle’s Sharpening The Warrior’s Edge, 1995, pp. 18–23. Patrick R. Veillette, “Re-Examination of Stall/Spin Prevention Training,” Transportation Research Record, No. 1379, National Research Council, Transportation Research Board, 1993. David Lee Bagby, “A Study to Determine Basic Aerobatics as a Requirement for the Commercial Pilot Certificate,” Sky Harbor Resident Center: Embry-Riddle Aeronautical University Extended Campus, August 1997. Paul Bertorelli, “Yank-Bank Limits,” Aviation Safety, September 2005. Malcolm White, “Dear Pitts Owner,” Letter from Aviat, Inc., September 1995. For example, see The Light Airplane Pilot’s Guide to Stall/Spin Awareness by Stowell, in particular “Who’s Spinning In,” pp. 80–87. This applies with equal force to UPRT for general aviation pilots.